Showers and storms have become better organized last night south of Mexico. Tropical depression 2-e likely formed at least six hours ago. The hurricane center's track takes it close to land by early Tuesday Morning. Right now it looks like it will stay offshore. It's also possibe if the northeast shear relaxes that this will become a hurriacane. 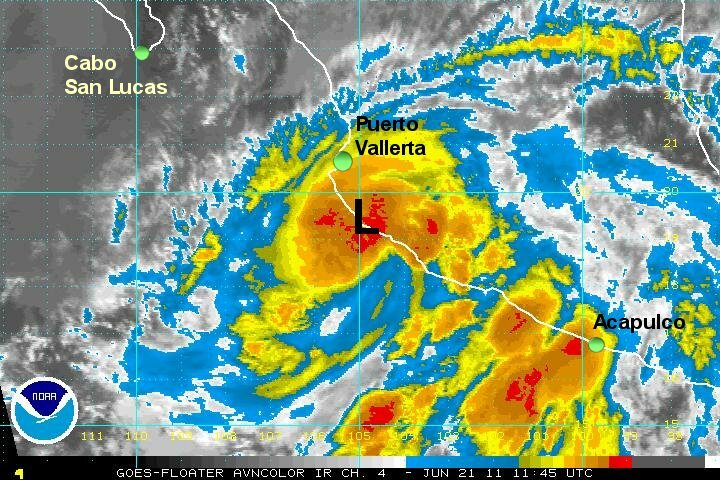 Tropical depression 2 E is centered near 13.7 N / 99.9 w or about 335 miles south southeast of Lazaro Cardenas, Mexico. Movement is west northwest at about 9 mph. Top sustained winds are estimated at 40 mph / 35 (NHC) mph. Pressure estimated at 1006 mb. Interests on the west coast of Mexico should follow this system. Deep convection is exploding near Beatriz. The center of circulation is not directly under the center of the low. Because of this strengthening is likely, but not in an explosive way. Coastal areas will expect heavy rain, and winds increasing today with Beatriz coming close to the coast by early tomorrow. Forecast models have shifted more toward the coast through 24 hours, then recurve the tropical cyclone out to sea ( west ) after that. 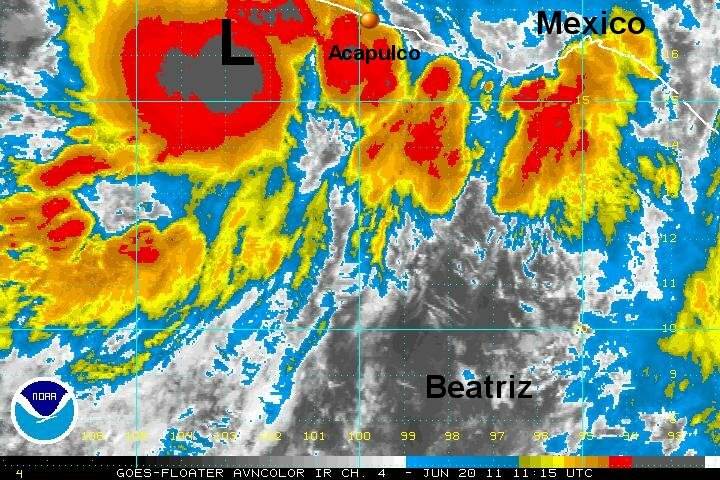 Beatriz is centered near 16.0 N / 102.8 w or about 245 miles south southeast of Manzanillo, Mexico. Movement is northwest at about 10 mph. Top sustained winds are estimated at 60 mph / 60 (NHC) mph. Pressure estimated at 997 mb. Beatriz is on the coast. An eye was briefly visible for several hours last night. With the circulation interacting with land it is now weakening. The hurricane probalby was up to about 80 mph but looks to be about 70 mph now as the structure is getting disrupted. 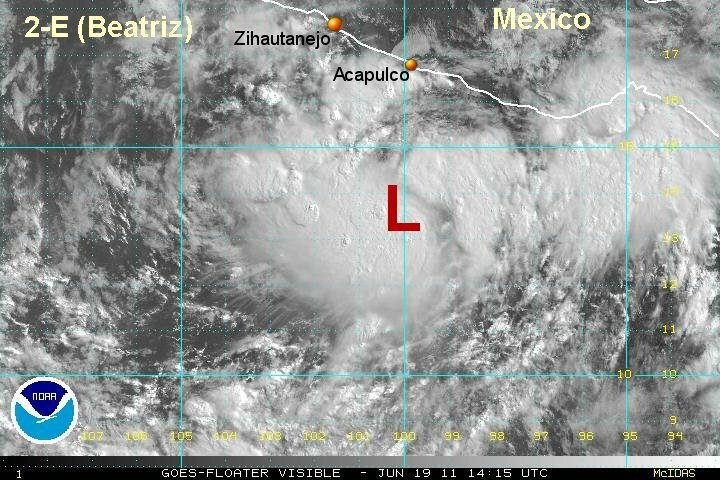 Beatriz is centered near 19.4 N / 105.0 w or near La Fortuna, Mexico. Movement is northwest at about 13 mph. Top sustained winds are estimated at 65 mph / 90 mph (NHC last advisory). Pressure estimated at 977 mb.